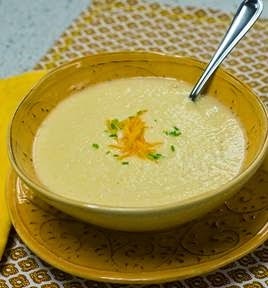 Now that the dead of winter is here and the ice, snow and cold is setting in...I am looking for easy recipe to make that fill & warm your tummy up. Today's recipe is courtesy of the great folks over at Medifast and it looks absolutely delicious! Definitely adding this one to my "must make" list. The recipe will make 2 servings. 1. In a medium pot, steam cauliflower florets in about one-quarter to one-half cup of water on medium-high heat until tender. 2. Mash cauliflower. Add broth, salt, garlic powder, and onion powder to pot, and bring to a boil. 3. Remove from heat. Stir in cheese. 4. Transfer mixture to a blender (or use an immersion blender), and puree soup until smooth. Serve immediately. I love the combination of cauliflower and cheddar cheese. I shall definitely be making this,recipe soon - especially since it still is so,cold.